Sgt. 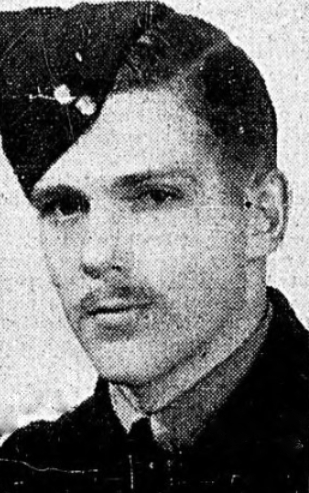 Joseph M. Dutton was one of the original 419 Squadron pilots, coming to the squadron in early March 1942. Flying his first operation on March 10th. 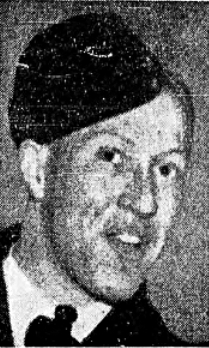 1942 as Second Pilot. This was during a time when the squadron flew with two pilots on each operation. Flying a second sortie in the 2nd.Pilot slot on the 28th of March he soon took up the position of Captain on April 12th. flying with F/Sgt. McGuffin as 2nd. Pilot. Flying with him on that first operation as captain was Sgt. 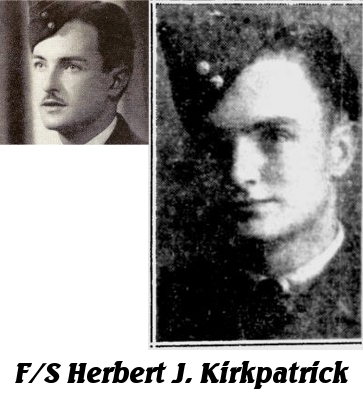 Kirkpatrick, Sgt. Rice, F/S Arthur as WAG and F/S Dell as Air Gunner. Sgt. Kirkpatrick was not available for the next and Sgt. Pearce took his place, Kirkpatrick would remain as Dutton's Navigator for nine operations. 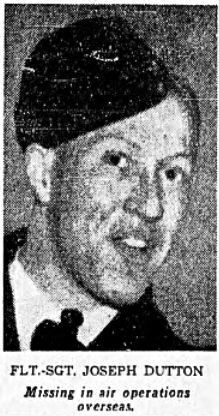 The crew's Wireless Operator Sgt. Rice flew nine operations with them, on one operation (May 8th.) Sgt. Freestone was W/O. After May 2nd. the crews flew with only the one pilot. F/S McGuffin captained his own crew and was with 419 Squadron until he was lost on Dutton's WAG was Sgt. Sveinson flying five operations, while Sgt. McCaw was Air Gunner during those sorties. F/Sgt. McCaw became the WAG with P/O Peters joining the crew on May 30th and flying four ops. 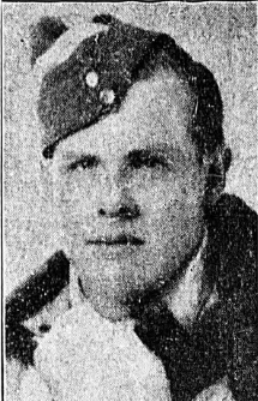 On the nights of June 1/2, 2/3 the squadron was sent to Essen.. and F/S Dutton and his crew flew both tose sorties. On the night of June 5/6 the Dutton crew was again sent to Essen. Wellington X3486 squadron ID VR-U took off at 2345 nothing further was heard from the aircraft until 1950s. Documents from 1950s show that the crew's Wellington came down at Milchplats/Eversdael on the morning of June 6th. The men were originally buried at Krefeld, but by 1950 the graves had disappeared and no exact location of where the Wellington had crashed was known by those now living in the area. As the crew's remains could not be found their names were placed on the Runnymede Memorial. Pilot Age 23 on his 30th Op. From Granville Ferry, Annapolis Co. N.S.